Dusty looks innocent and pleads the 5th! George here to tell you about our latest adventure with two Weims……. Anyway, Claire bought one of those unstuffed dog toys, the type you see advertised on TV that are already unstuffed, so there is nothing to tear out of them, at the local hardware store. I pointed out the we had 2 dogs, so we held off giving it to Heidi, who always wanders around with something in her mouth, either a the remnant of a toy that has long since been gutted, or one of her blankets, as something to trade in exchange for attention. After Claire came home the next day with another toy, we proceeded to give them each one. Heidi did the expected thing, taking hers to her basket and proceeding to squeak it (one in each end!) until she could figure out how to put it out of it’s (her?) misery. Major ran into the bedroom, presumably to do the same, and when Claire came in to check on him, he must have thought she was going to take it away (Heidi has predominate ownership of all things not immediately edible, in which case he asserts dominance if it is actual food), he swallowed it whole. The toys are not very large, maybe 9 inches in length, with a squeaker in each end. Claire was panicked, and I immediately thought of Dusty’s little adventure, but having watched both of them at other times swallow a whole spare rib bone and throw it up the next morning, clean as a whistle, I was a little more sanguine, but called the Vet immediately. I took Major (and the other toy) to the Vet, where he was treated to a large dose of hydrogen peroxide, and after about ten minutes the desired effect produced a multipart toy, complete with both squeakers. The Vet was very glad we had a whole to compare, so as to not have to wonder if we got it all. Just thought I might pass this on, needless to say, Claire has tossed all remaining toy remnants, and Heidi now has to settle for dragging one of her throw blankets with innumerable teething holes, around with her, trying not to trip on what doesn’t fit in her mouth, but at least we don’t have to worry about anyone swallowing something they can’t digest or we can’t retrieve. I will get you some pictures of the pair sometime this summer. Fortunately Major has wound down some (and we moved the invisible fence back from the road, which has helped a lot), but I think I threw my back walking him (to much of a good thing too fast). 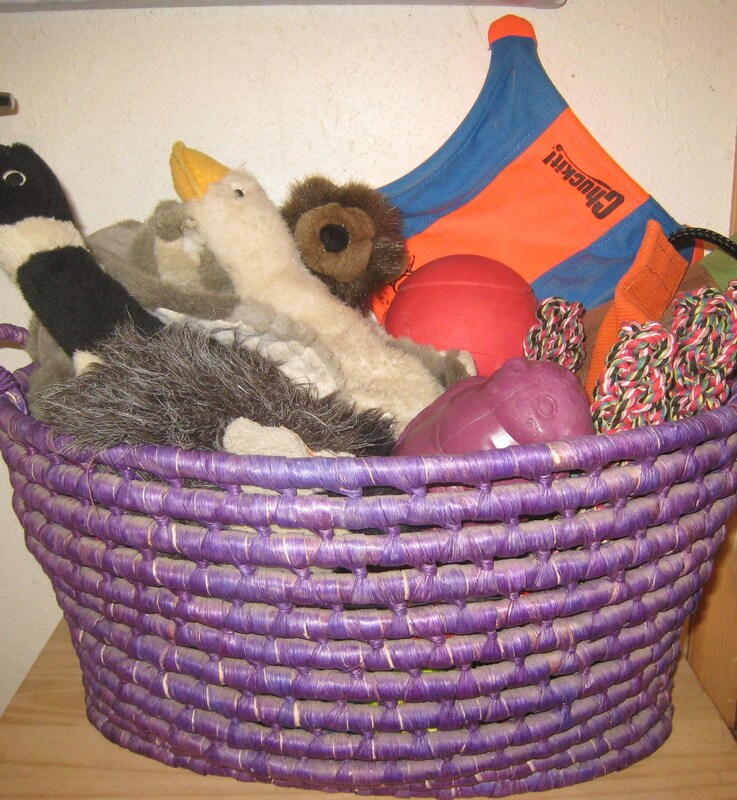 Breeder’s Note: We actually recommend the flat toys or the unstuffed toys, however, they should be the larger ones and we suggest all soft toys be closely supervised. The same with any soft item that might chewable including bedding. 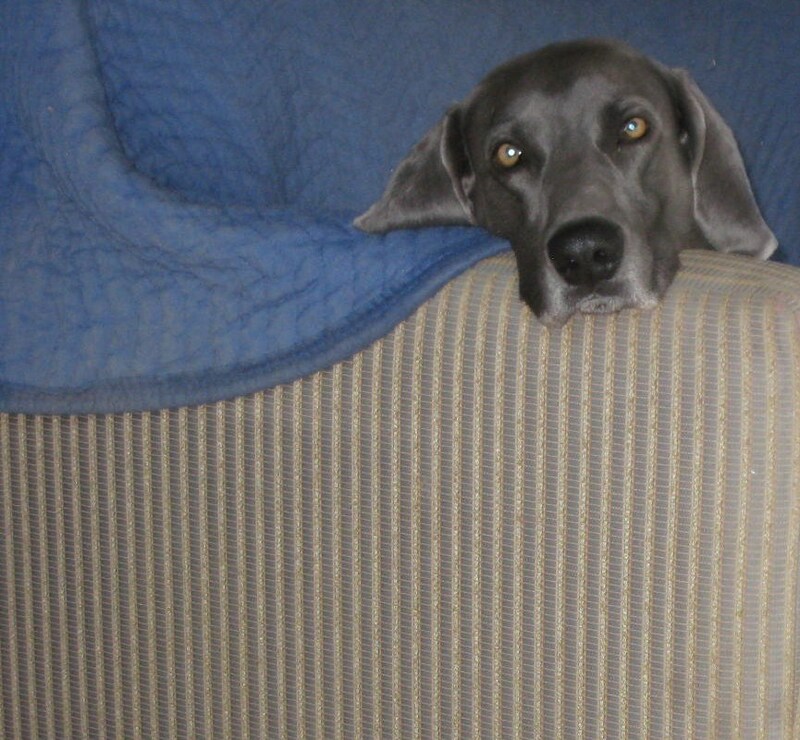 Some Weims will eat anything and for those you cannot turn your back on them. Or simple–you must keep a constant watch when they have a toy such as this. 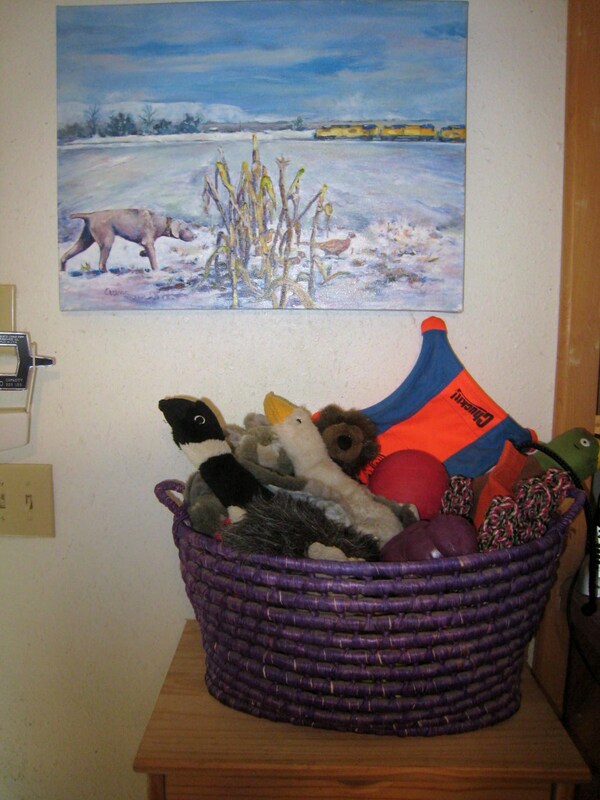 We keep our stuffed toys, bumpers, and some of the balls in a large reed basket on top of a cabinet. We recommend watching even the durable Kong Toys and such as they can degenerate over time and need replacing. When they start to crack or bits fall off it is best to toss them. Intestinal blockages are life-threatening and can result in panic. That doesn’t even cover the sticker shock after you get through the ordeal. We thank George for sharing their experience. Posted on July 28, 2010, in Mollie X Dusty, Previous Pup Update, True X Dusty. Bookmark the permalink. 1 Comment.